The beautiful coastline of Great Barrier Island, ranging from inland tidal wetlands, sheltered bays and sandy beaches to stretches of rugged ocean shoreline, offers wonderful opportunities for both the beginner and the experienced kayaker alike. Sea kayaking is growing in popularity and as Stray Possum Lodge is close to the waterfront we quite often see boaties leave their kayaks by the wharf at Tryphena after the six hour paddle from the mainland, refresh themselves with a hot shower at the Backpacker lodge and a hot meal and a cold drink at the Stray Bar and Restaurant. After a good sleep at the lodge they head off the next day on their adventure. Others bring their craft with them on the Eco Islander and stay with us while they explore the coast. 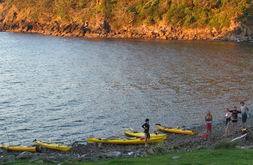 Several operators offer a range of kayaking opportunities on Great Barrier Island. At Aotea Kayak Adventures Wayne Anderson has a good range of single and double sea kayaks. Situated at Mulberry Grove in Tryphena he offers various guided packages including a two hour harbour cruise, a two and a half hour sunset paddle, a four to five hour kayak/snorkel adventure and a night trip. Book with us or contact Wayne direct at aoteakayak@hotmail.com or 09 429 0664. Bryce and Chona Groves hire out kayaks at the Kaitoke river in the centre of the Island and from there the Kaitoke wetlands are accessable upriver or cruise down to the beach and open sea. Phone 09 429 0987. In Port Fitzroy Tony Bouzaid at Glenfern Sanctuary has kayaks for hire. Phone 09 429 0492. At Claris in the centre of the Island Hooked on Barrier has one and two man kayaks for hire along with a great range of fishing and diving gear. Phone 09 429 0417. GBI Rentals in Tryphena also has several kayaks for hire. Phone 09 429 0062. For those wishing to experience the coastline of Great Barrier Island a kayaking adventure is a must but remember to pre book during the summer months and holiday weekends!